It is in deep sadness that we report that this panel became the last public presentation by artist Madiha Aijaz, who unexpectedly passed away a few days later. Our deepest condolences to her family, friends, colleagues and students. This report was written before the writer’s and our knowledge of her passing. In commemoration of her life and career, extracts from the panel discussion will be made available to listen to in the coming days. On Monday (28 January), an IFFR panel discussion explored the diverse landscape of artists' moving image in Asia, from local, inter-regional and global perspectives. Also discussed were organisations providing support for artists’ moving image production. Found-footage and appropriation emerged as strategies used by artists to explore personal and collective memory and censorship. The great variation in conditions for filmmaking culture in Asia was apparent from the outset of the discussion. Some regions—Vietnam, for example—face challenges imposed by limited infrastructure; some navigate problems of censorship; and others—Hong Kong, for instance—must balance the significant economic power of its institutions with a sensitivity for the often ephemeral and precarious nature of artistic production. Underpinning the discussion was a desire to nourish creativity despite—and perhaps even because of—restrictive conditions. The panelists were Nguyen Trinh Thi (artist and founder of Hanoi Doc Lab, Vietnam); Madiha Aijaz (artist, Pakistan); Su Hui-Yu (artist, Taiwan); and Chanel Kong (associate curator of moving image at M+, Hong Kong). Moderated by May Adadol Ingawanij (curator, researcher and co-director of CREAM), the panel was introduced by Philippa Lovatt (lecturer and primary investigator at the South East Asian Cinemas Research Network, or SEACRN). In her films, photography and writing Madiha AIJAZ (1981-2019, Pakistan) explores the experience of pleasure and privacy in urban spaces. Lovatt began by introducing SEACRN’s research project, 'Artists' Moving Image in Asia.' Begun in 2016, it has unfolded in a series of events attached to film festivals in Los Angeles, Hanoi and Glasgow. Lovatt emphasised the curatorial and collaborative aspects of the project, which involves artists, activists, academics and curators. She explained that artist filmmaking in Southeast Asia often depends on individuals’ creative energies and commitment, and can wane due to burn-out or insufficient material resources. Although new initiatives are begun all the time, their delivery can be uneven and short-lived. Asian Artist Moving Image Platform in Seoul has tried to map and formalise initiatives in the field, but it too is dependent on its founders’ limited time and resources. Lovatt mentioned some institutional help available to the region in recent years, including that of the Japan Foundation's Asia Center (begun in 2014), the Alliance Francais, Goethe Institute and British Council. Lovatt elaborated on themes of memory and censorship that have emerged in recent Southeast Asian filmmaking. 'How might film be a memory machine to explore the experience of censorship, and what role does affect play in communicating memory or its suppression?' she asked. Lovatt proposed that Thai filmmaker Anocha Suwichakornpong's film By the Time it Gets Dark (2017) employs a non-linear narrative to explore repressed memory. She also mentioned Filipino filmmaker Shireen Seno, who has spoken about film's capacity to help overcome institutional and personal lapses of memory. This same theme emerges in this year’s IFFR—for example, at the exhibition 'Blackout,' curated by IFFR programmer Julian Ross and installed at Rotterdam's Kunsthal. One piece in the exhibition is panelist Trinh Thi Nguyen’s Landscape Series # 1 (2013), a slideshow of anonymous photographs taken in the Vietnamese landscape that all contain a person pointing at something outside the frame. The gesture of pointing is an articulation, Lovatt suggested, of a contrapuntal sense of time in which specters from the past (the out-of-frame) haunt the present. Sometimes the medium of film itself becomes haunted through the incorporation of sounds and images from elsewhere. Lovatt used the example of Thai filmmaker Apichatpong Weerasethakul's Primitive (2009-) that is set in a site of historical trauma and suppressed memory on the Thailand-Laos border. In both installation and feature versions, Primitive explores Thailand’s 'double trauma' of violent oppression and its later suppression. Film, Lovatt summarised, can be an audio-visual palimpsest of energies and temporalities. A series of mysterious photographs of people pointing into Vietnamese landscapes becomes a commentary on news events in this slide installation. found-footage for creating new meanings. She explained the necessity of working 'intelligently' and 'ecologically' from the 'litter' of other films, when accessing official archives in Vietnam is either prohibited or prohibitively expensive. Aijaz continued discussing material and spatial limitations. She shared excerpts of These Silences are All the Words (IFFR 2019), her observational documentary about public libraries in Karachi, Pakistan, which is showing in the 3rd Tiger Shorts programme. The film explores the erosion of the Urdu language, literary traditions and library use. Aijaz was interested to study Karachi through its libraries, framing them as refugees from Pakistan’s recent right-wing politics and increasing surveillance measures. The first iteration of the project was presented at Karachi Biennial, installed in a Theosophical Society’s empty library. Aijaz selected Theosophy for its focus on comparative religion, which she contrasts with what she describes as Pakistan's recent, monotheistic brand of Islam. 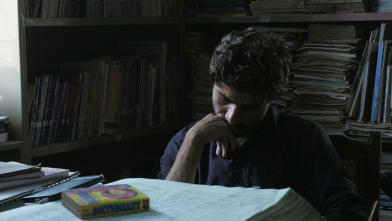 There are 126 public libraries in Karachi, and Aijaz's documenting them continues. 'screening:' as a means of showing and suppressing material. Su is interested in Taiwan's period of martial law (1949-87) and exploring it without slipping into what he calls 'a language of paralysis.' His film recreates scenes that only existed in the screenplay of a 1985 Taiwanese cult film, Tang Chao Chi Li, and were left un-shot due to budgetary and censorship constraints. Su’s additions bring an indeterminate and dreamlike eroticism that he explains were present in the screenplay but unable to be realised until now. the Hong Kong government and currently under construction as part of a huge waterfront arts complex in West Kowloon, M+ will be dedicated to 20th and 21 st century visual culture. It will provide a platform for moving image, visual art, design and architecture. Kong emphasised M+’s ambitions in building digital-native collections alongside traditional ones. M+'s programming will unfold across its vast space (comparable to that of the Pompidou Centre and Tate's Tanks) which includes a mediatheque, galleries, cinemas, studios and external LED façade. Despite such a large footprint, Kong added, M+ is invested in democratizing collections and telling under-told stories. She explained the importance of an 'ecological' museum practice that places less emphasis on the museum's authority and more on partnering with local organisations. Kong showed slides of artists’ moving image work M+ is currently collecting, including that of Nam Jun Paik, Paul Chan, Isaac Julien, Zhu Jia, Lin Yilin, Sun Xun, and Lee Kit. From Hong Kong, artists include Wong Ping (winner in IFFR’s Tiger Shorts programme this year) and Ellen Pau, and from mainland China, Ming Wong, Tehching Hsieh, and Cheng Ran. Wong Ping, Vincent Meessen and Nina Fischer and Maroan el Sani winners of the Ammodo Tiger Short Competition 2019. The panel took two questions from Ingawanji. The first concerned the label 'Asia,' and its relevancy. Lovatt responded that locality was very important throughout the SEACRN project, which had either used the label ‘Southeast Asia’ or more regional-specific names. She too was wondering how 'Asia' relates to localised practices, and how best to situate the one within the other. Responding to this, Nguyen explained her frequent discomfort in being framed—as a woman, as a Vietnamese artist, as a Southeast Asian artist– 'I don't even know who I am myself, I have so many influences, we are all a product.' Kong responded by explaining that M+ will try to negotiate local and global perspectives. She used the example of ink painting practices in East Asia, explaining that they could be contextualised on many levels from local to global. Flexible curatorial strategies can make ‘inroads,’ she continued, and encourage a plurality of interpretation. Ingawanij’s second question considered the media’s role in representing the past. Su responded that his work appropriates media from the 1980s, not from nostalgia but as a way to understand collective memory. His two-channel video installation, Super Taboo (2017) explores censorship through pornographic imagery. Although Taiwan is currently experiencing peace, a fully industrialised economy, voting and human rights, and little censorship, Super Taboo preserves the memory of a time when Taiwan’s government could destroy archives. Nguyen summarised her reasons for appropriating popular film: 'people's perceptions were influenced by the movies,' she said, 'making a film can be a reflection on the process of image making and one's own gaze.' Fifth Cinema is a complicated mesh of looks exchanged by minority groups, indigenous peoples, women, north and south Vietnamese… all these looks, Nguyen explained, are part of a power structure. Analysing them is a way to reflect on the current state of society—in Asia and beyond.